The Valley Macadamia Group is committed to sourcing and supplying quality macadamia nuts and products from farm to fork. We source only the best nuts from trusted growers. We nurture mutually beneficial relationships with our growers. Have world-class processes and equipment. What’s more, we have a network of customers around the world who trust us to deliver quality nuts, on time and on demand. Valley Macadamia Group is committed to building long-lasting rewarding relationships with trusted growers. Not only do we seek out markets for our growers, we provide ongoing information and advice, access to shared knowledge and farming trends and, importantly, payment terms that benefit our network of growers’ bottom line. Our transparent payment model means there are no hidden costs for our growers. We pay what we quote and have the fastest payment terms in the industry. The best part is, we consistently achieve the highest returns for our growers, irrespective of market conditions. Got nuts? Partner with a global leader who puts you first. Allan Sutton, Valley Macadamias Group Chairman, explains the business of commercial macadamia nut farming and the global nut industry. South Africa is the largest producer of macadamia nuts worldwide. 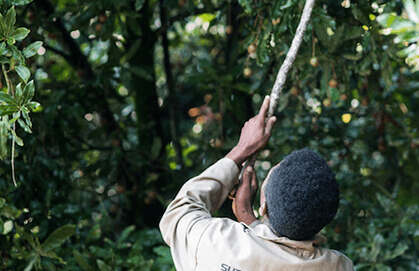 Here’s how macadamia farming is boosting the South African economy. There’s a whole lot more to macadamia nuts than their delicious taste, they offer exceptional health benefits and lucrative, sustainable farming opportunities for local growers too. Valley Macadamia believes in crafting a long-lasting partnership with our growers. Subscribe to our newsletter for news, information and technical advice that will add real value to you and your farm.